Shiretokoiozan is an active volcano located in northern part of Japan. It is an only one volcano on the earth which erupt a huge amount of molten sulfur. 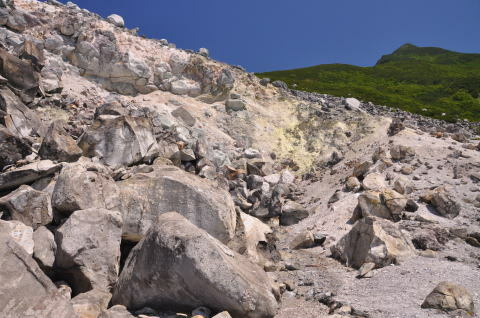 In 1936 Shiretokoiozan spouted 200,000 tons of sulfur at the Crater One and it flowed more than 1.5 kilometers along Kamuiwakka Creek. It has not erupted for 78 years since the last eruption. I guess next eruption is coming soon.